How far are you in the game? Since its been about a week since KH3 finally came out I was wondering how far peole have got through the game and whether yall like it.Wouldn't be surprised if some of you are done already Please no spoilers since Im stell in the middle of the Tangled world I believe. But I am LOVING IT and I hope every one of you is too! Finished it already. Just going through and doing all of the post-game stuff, minigames, and treasure/lucky emblem hunting. In terms of post-game stuff I've already found all the emblems, got the high score for the flans, and treasures on Frozen slider. Working on the other stuff to get Ultima Weapon. Finished it yesterday. Was gonna try to get Ultima, but I'm gonna replay the game in Proud, and I may alternate between that file and the older one. I am enjoying the little jokes so far they have of the game kind of being aware of itself! Do you guys like that? I'm still only in Frozen lol. But after this world I also need to do heaps of backtracking so I can't see myself finishing this until late Feb or early March, especially since there is also something else I'm trying to get through at the same time. I finished it in Japanese back on the 31st, with 55 hours played. Now I'm just starting Monstropolis in the English version, about 25 hours because I've been completing absolutely everything I can as I go this time. I've been loving it, still am. Playing with my kids, who are big fans now too. My family is bilingual. Personally I love the Square characters' voices in both languages, although I have particular favourites in each - Xemnas has a sort of villainous drawl that is different and yet has the same effect in both languages; Japanese Sora is a little too whiny for my tastes, but Riku is great; Roxas/Ventus has such an endearing voice in English, although his Japanese voice isn't bad; Aqua's Japanese is unremarkable but her English is amazing, with such pathos; and so on. But the Disney voices are without a doubt better in English. After all, it's the native language of the movies, and with a few exceptions they tend to lose a bit in translation. I tend to prefer things in their native language, although this game makes that concept a bit wonky. Amusingly, Donald seems the same voice regardless of language! I guess perhaps I'm in a minority because I love the weird, convoluted story. I've always viewed the Disney worlds as fun diversions between the real plot, mostly without much meaning. In that respect, the worlds this time seem to be a bit better than in previous games. Really, Kingdom Hearts has always been a mixed bag of fun stuff to play with, including a little of everything, all bound together with a traditional Square story made up of increasing layers of complexity. It would be fair to say that the things that others complain about are the very things that attract me to the series. I'm about to start my third play-through and make it a speedrun. Thorf thats awsome you play with your kids. How old are they? Given the thirteen year wait, I would have been happy to take it much slower. But the threat of spoilers was so huge that I didn't want to risk it. Still, I'm savouring the second play through instead. 8, 6, and 2. Which means that between KHII and III, I got married and had three kids with my wife. Currently my 6-year-old is up to Corona in her play through on Beginner. Her favourite character is Kairi. 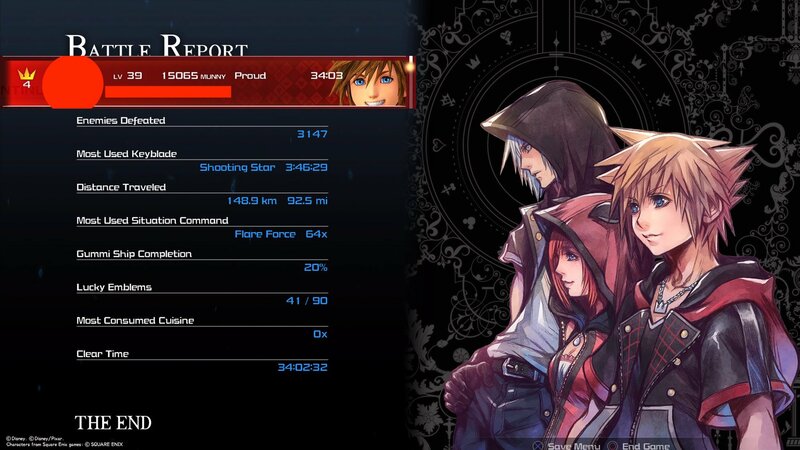 We've had a bit of a whirlwind the past couple of months, actually, as since Christmas we've played through KH, KHII, Birth by Sleep (all three characters) and then Dream Drop Distance, as well as watching all the movies. I didn't think it would be fair for my kids to suddenly jump to KHIII, after all. Just finished the game and i gotta say i was pretty pumped throughout the whole game. Finished it on Tuesday. Took little over a week. Going to focus on the Battle Gates now. finished about exactly a day ago. I have my disappointments but overall I love it! I'm in olympus now again trying to 100% chests and emblems/other stuff I missed. I had the map turned off the entire game and I turned it on real quick just to turn it off again, I want to keep this exploration feeling vast! Side note/mild early world gameplay spoiler, I love that they changed olympus a bit with the town being rebuilt, and there are people at the town now/new dialouge from herc etc. It really feels like time has passed! If you'd like, there are guides online for where to find both treasures chests and Lucky Emblems. Very good guides. Wow! I didn't know you could get a different artwork depending on the difficulty you finished the game! Like a few others in the thread I'm currently in the post game grinding for the Ultima Weapon. I'm struggling hard though with finding the treasures in the mini game and finding the flans. I was in the process of getting the platinum, before accidentally crafting an item twice for which the materials are limited. Now I'm scared of going on only to possibly find that this might lock me out of the synthesis trophy. Googling promised that it's not the case, but nowhere did I find any help on how to "undo" my mistake or find spares of said material.